Dracula's castle has risen again and it's up to the mysterious Alucard to face Dracula and save the world from his nocturnal embrace. Discover hidden rooms, fight dangerous enemies and equip hundreds of weapons to uncover the secret behind Dracula's power before it's too late. 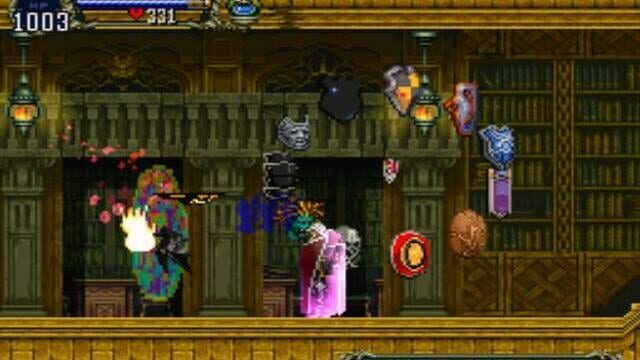 The OST, the inverted castle, Alucard, magic, exploration, artifacts, forms, items, bosses and common enemies, rooms. There's nothing wrong with SotN. 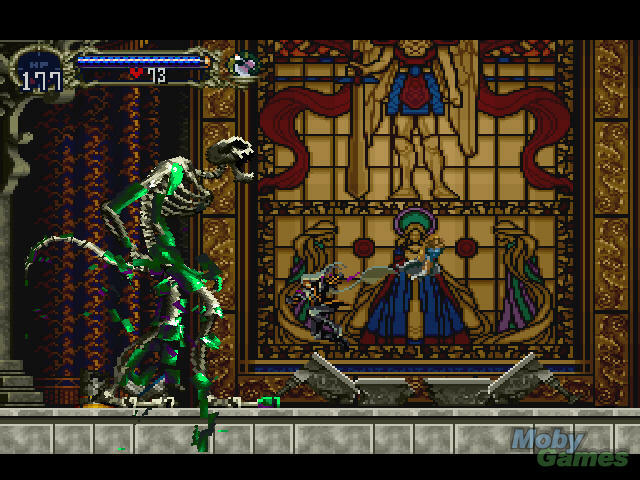 probably the best Castlevania ever and one of the greatest games ever created. I love it. Castlevania: Symphony of the Night begins during the ending of the previous game in the series, Castlevania: Rondo of Blood, where Richter Belmont (Michael G.; David Vincent in the redub) confronts and defeats Count Dracula (Scott McCulloch; Patrick Seitz in the redub). Four years later, in 1796, Alucard (Robert Belgrade; Yuri Lowenthal in the redub) arrives at the castle. 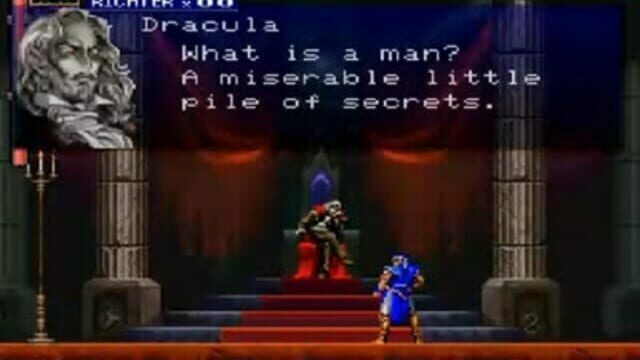 Inside, he meets Dracula's servant Death (Dennis Falt; Travis Willingham in the redub), who warns him to stop his quest to destroy the castle and strips him of his equipment. He also meets Maria Renard (Kimberly Forsythe; Michelle Ruff in the redub), a seventeen-year-old vampire hunter who fought alongside Richter and is now searching for him, and the castle's librarian, who sells items and equipment to Alucard. 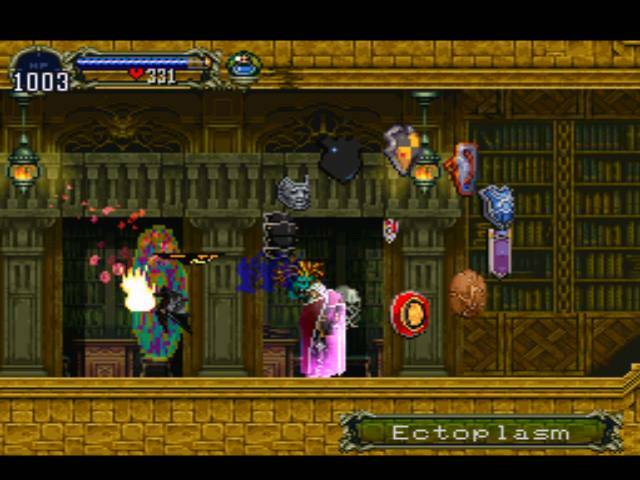 Periodically encountering Maria throughout the castle, Alucard also meets Richter, who claims to be the new lord of the castle and forces him to battle with two monsters. Alucard defeats the monsters, finds Maria again, and tells her about Richter. Upset, she leaves Alucard to confirm it for herself. Convinced that Richter is under somebody else's control, Maria meets Alucard again; she urges him not to hurt Richter and gives him an item that allows him to see past illusions. 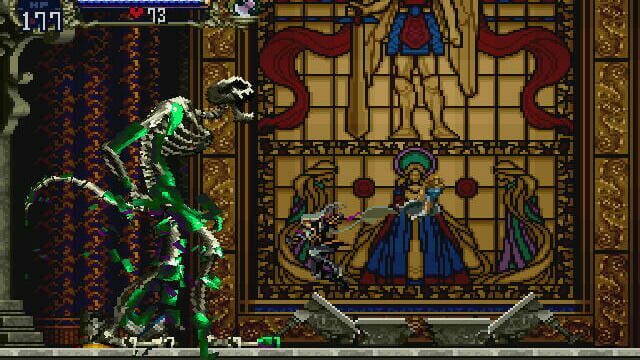 In the castle's keep, Alucard confronts Richter and learns that he plans to resurrect Dracula so he may battle the vampire for eternity. Alucard breaks the spell controlling Richter. Dracula's servant Shaft (Jeff Manning; Tony Oliver in the redub) appears and reveals that despite the spell being broken, Dracula will be resurrected soon. Shaft summons an inverted version of the castle. Alucard leaves Richter to Maria's care and enters the inverted castle to find and destroy Shaft. Along the way, he defeats Death and eventually finds Shaft. Shaft admits he planned to end the threat of the Belmont clan by controlling one as the master of the castle and forcing them to fight each other. Alucard defeats Shaft, who reveals that Dracula's resurrection is complete. Alucard faces his own father, who vows to destroy humankind because Alucard's mother Lisa was executed as a witch. Alucard refuses to join his father in his revenge and the two battle. Alucard defeats his father and suggests he lost the battle because he lost his ability to love after Lisa's death. Dracula quotes the biblical verse Matthew 16:26 (in the dub) and learns that Lisa's final words were of eternal love for him and a plea not to hate – or at least harm – humanity. As Dracula vanishes, he asks for Lisa's forgiveness and bids his son farewell. Escaping the crumbling castle, Alucard rejoins Maria and Richter. Maria expresses relief that he escaped while Richter blames himself as the reason for Alucard's fight with his father. 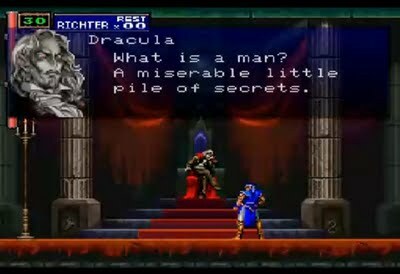 Alucard tells Richter, "the only thing necessary for evil to triumph is for good men to do nothing," (an attributed quote from Edmund Burke) and resolves to disappear from the world because of his cursed bloodline. Depending on how much of the castle the player has explored, Maria either chases Alucard in the hope of changing his mind, or resigns herself to Alucard's fate and leaves with Richter.